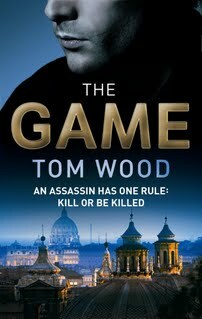 Today’s guest blog is by Tom Wood who is the author of the series featuring Victor a professional assassin. THE GAME, the third novel in my series about a professional killer known only as Victor, has just been published in the UK. The story begins with Victor stalking a fellow assassin through the streets of Algiers and from there he is drawn into his most dangerous assignment yet: posing as his victim to uncover the assassin’s next mark. It’s a job that pushes Victor to the absolute limit, both physically and emotionally. It was a tough book to write, but very rewarding. When I first began working on my debut, THE HUNTER, it was many moons ago and I had no grand plans for a series back. I had absolutely no idea what might second book would be, let alone my third. In fact, I didn’t even dare think that there might be a second book. It was hard enough getting that first one finished to the point where I felt it was ready to send out to an agent and then a publisher, let alone plan for what came next. I suppose if I had been on the ball back then I would have done a few things differently with THE HUNTER to make writing the following books a little easier on myself. In fact I took some decisions then that have come back to bite me on the behind more than once, and will forever more. Nevertheless, I think for the majority of writers the first novel is such a mountain to climb that it would be foolhardy to think about what mountains we might later attempt while still struggling to reach that first summit. I’m not yet experienced enough to know whether writing a series is more straightforward than writing standalones, but I do know that I thought it would be more straightforward than it’s turned out to be. There is a lot to consider. With each book a back-story is being cemented and with it potential future scenarios are increasingly limited if one wishes to provide originality with each novel. However, maybe readers don’t want something new each time out, maybe they want to read more of the same. I don’t know. I don’t think I can know. I can do only what I think is correct. From my own selfish perspective, I want to try something a little different with each book. I don’t want repeat myself. I’m writing about a professional assassin, so at the simplest level (and without giving too much away) I use his line of work to place him in a different situation each time out. In THE HUNTER Victor is betrayed and on the run in the aftermath of a hit at the very start of the book, whereas in THE ENEMY he is very much the aggressor, performing a number of individual (but connected) assignments that cause him increasing amounts of difficulty, while in THE GAME he has one single job to do that becomes far more complex and challenging than even he could anticipate. When I took the decision to write a second book about Victor, it immediately felt right. I realised I just had to find out what happened to him next. He had survived against impossible odds and in doing so his whole life had been turned upside down. His story couldn’t be over. So I went back and made sure to leave a few story threads open at the end of that first book, partially because I never intended the book to wrap up everything neatly, but also to potentially draw upon those threads at later points. As a reader, I’m not a big fan of finding out in book nine of a series that the main character has beloved cousin who he or she now must do anything to protect. If that cousin were so important, why has there been no mention of them in the previous eight books? I didn’t want to be that kind of writer. However, I also didn’t want my books to be inaccessible to readers who had not read the previous ones. Therefore, I find myself with two opposing philosophies that must be balanced. I did mention earlier that I don’t make things easy on myself, right? But, regardless of the difficulties of writing a series I couldn’t be happier doing what I’m doing. Victor, despite his nefarious profession, is great fun to write about. He can be as ruthless or as honourable as I want and gets into the kind of dire straits that would be implausible if not downright silly with any other kind of protagonist, and perhaps most importantly of all he can get himself out again. That combination lets my imagination go berserk with possibilities and means that his escapades are never dull. Moreover, that is probably the single biggest reason why I ended up writing about him and not another character. I am easily bored. I do not like sitting still. As a reader, I want to get to the meat of the story as soon as possible. I do not want padding. I want thrills and spills. I do not want endless back-story (if it’s so interesting it should be the main story!) Victor’s high-octane adventures were born out of my own short attention span. My motto when I began writing was to pen thrillers with the boring bits taken out. I like to think if they can hold my interest writing them they should easily hold a reader’s attention when they’re clutching the finished product. The Game - Victor is the perfect killer. He has no past. He will stop at nothing. And he can find you anywhere. In sweltering Algiers, ultra-efficient hitman Victor executes a fellow assassin. But when the CIA comes calling, Victor must pose as his victim to identify the dead man's next mark, a mission that takes him across Europe to the bloody streets of Rome. Working alongside a group of vicious mercenaries, Victor faces an impossible choice: to do what's right, or to sacrifice the only thing he cares about . . . his life. I like your approach to thriller writing and will seek out your books. Which authors have influenced your subject matter and writing style the most? I hope you enjoy them. Two strong influences would be David Morrell and Kevin Wignall.